The McHI Boys Varsity will be scrimmaging at Sharyland Pioneer starting at 10:00 am this morning. McHi will be scrimmaging Pioneer, St Joseph and Donna. JV and Varsity basketball scrimmage today at McHi starting at 3:00 pm. Others teams at the scrimmage will be PSJA Memorial and La Grulla. McHi suffered a 54-37 loss to El Paso Bowie during their third game in the South San Tourney. The Bulldogs will face San Antonio Sam Houston or Silsbee tomorrow morning. 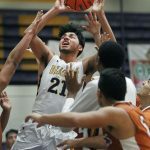 The McHi varsity basketball team defeated Eagle Pass 75-57 on Friday afternoon. They were going to play El Paso Bowie later in the day.